I didn't set out to crash three GoPro cameras and another $1,000 worth of electronics from more than 65,000 feet. 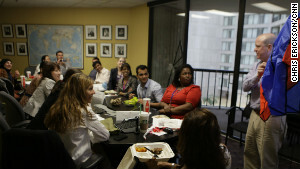 I simply wanted to organize a visual story for 12 international journalists who were visiting CNN headquarters in Atlanta in June. Getting video from the "edge of space" seemed like an easy idea that would make for great television and a great story. In the past few years, low-orbit photography - that is, taking photos and videos from high up in the atmosphere - has been growing as a hobby. As cameras and GPS devices become cheaper and more reliable, just about anyone can do it, not just tech geeks. 1. Find low-orbit photography enthusiasts. Give them GoPro cameras and have them build a camera delivery vehicle with parachute. 2. Launch cameras with weather balloon. 3. Have cameras come back to earth with video so reporters could do stories for their home countries’ television stations. Also aboard the balloon were an Android phone and an APRS beacon - a system based on amateur radio - for tracking purposes. 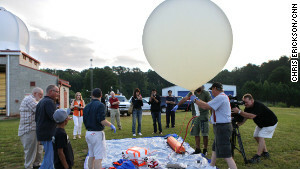 The National Weather Service was kind enough to let us launch from its station in Peachtree City, Georgia. Do not launch a weather balloon without permission from the FAA or other appropriate aviation authorities! We put together our payload, which became known as "Yeager," and headed for an early-morning launch from a small airfield south of Atlanta. It was still very dark and quiet. The serenity jolted me into the reality of the moment. I had spent so much effort in planning and logistics, but I was really nervous. The journalists, though, were in high spirits as we launched the giant weather balloon. With surprising power and quickness, it rapidly ascended up from our cheers and out of sight. Well, here's where the "crash" part comes in. We suspect our balloon and parachute ran into some strong upper-level winds, and the whole apparatus broke apart. Thousands of dollars worth of equipment and man-hours crashed into central Georgia. We did find our SPOT GPS unit attached to the parachute that was supposed to deliver our cameras safely. But the cameras had separated from the GPS unit. After the journalists and I gave up on finding the cameras, team members Mark Sudduth and Kerry Mallory continued the search. They looked in an area using the coordinates of our secondary tracking device, the APRS transmitter, which they were convinced had stayed with the cameras. They kept me updated with teasing phone calls reporting they were within 300 feet. But as the day dragged on, the heat, ticks and snakes, and deeply forested Georgia terrain got the best of them as night began to fall. At the end of the day: No cameras, no video, no story. Six months later, miraculously, we did find the cameras - intact, with all video. Briefly, here's how they got recovered: The Android phone had separated from the space-bound package. But get this: The phone had sent a message to its owner with its whereabouts when the man who found it, Justin Garrett, turned it on. The phone had survived the fall, landing in Garrett's backyard in Brooks, Georgia, a tiny town about 35 miles south of Atlanta. The Garrett house was the starting point for Mark and Kerry's subsequent search. At first, they didn't find anything else in that area, even after they realized that they had entered the coordinates of the cameras' location, as determined by the APRS transmitter, incorrectly into Google Earth. But the weekend of December 15, Mark and Kerry went back to try once more. With summer's leafy foliage gone, they returned to the Garrett house and hiked toward the coordinates that the APRS transmitter had delivered before. "I looked ahead and then it happened," Mark wrote on his website. "As if to almost call out my name, I saw it. Through the woods, probably 200 feet away, I spotted the bright orange against an otherwise dull brown and gray backdrop of dormant trees and thicket." Here's more on how Mark and Kerry did it. In the end we recovered all of our expensive equipment - intact and functional! - after its 12-mile free fall, got great video from the edge of space, which we sent to our international reporters, and wound up with even a better story than we anticipated. An interesting discussion is definitely worth comment. There's no doubt that that you should write more on this issue, it might not be a taboo matter but typically people don't talk about such issues. To the next! Many thanks!! Laws are something like:You need to clear the launch date and sight with the FAA, payloads need to be under 6-8lbs (cant remember) you can have larger payloads if they are seperated in 6-8lbs increments by a tether of some length. Generally the payloads are suspended from the parachute, and the balloon is attached to the top of the parachute so it's already in position the moment the balloon pops. After falling around 200 mph until the atmosphere thickens up the parachute will begin to function. I'm curious how they actually designed their payload. So what if the falling gear had hit a person? "Killer Cosmic Cameras Careen off Craniums"
I want to know what kind of phone that was. "In the past few years, low-orbit photography – that is, taking photos and videos from high up in the atmosphere "
Yes, but not in ORBIT. You cannot "orbit" without reaching escape velocity, and you ain't doing that in a balloon. I think the first thing FAA should check is whether these types of balloons can stand the ascend. Because that falling equipment could have landed on someone's head. Err... It was a weather balloon. They've been extensively tested for a LONG time, and often carrying far larger payloads. That was cool Brad thanks for sharing. No... you have the wrong evil IT behemoth... CNN actively promotes Apple. Try to keep up. You crazy right-wingers make me chuckle. Y'all also link to the crappiest websites. It's like browsing to a geocities website in the 90s. Yawn. Slow day at Max Dogfood? Next tell us the one about the Kenyan birth certificate. So dumb. Take off your tinfoil hat and listen... science is not evil. If you are easily convinced something is true and the self-appointed leader of your dogmatic fundamentalist cult said it is true (that science is ungodly) and also said that disagreeing with religious 'authorities like him is a quick route to 'hay-ulll'... that doesn't make it true. Believing something doesn't make it true... otherwise unicorns and fairies and invisible friends would be all around us. R-I-G-H-T! The International Space Station, 911, the Mars Rover, the Apollo Moon Landing, Obama's birth certificate, the Sandy Hook Massacre are all fakes but Saddam's WMD's and Reagan's trickle-down economics are real. Give me a break! Wow, there sure are a lot of "news stories" recently about GoPro cameras. What a wonderful marketing strategy, using the media as free publicity. And the public is falling for it. So you enjoy being one of P.T. Barnum's patrons? To boldly go where no news van has gone before! Does anyone know why the curve of the earth in the video seems to bends back and forth? The black of space should be bent around the earth. But at times the blue of earth appears curved around the black. Does anyone know why that happens or if the phenomenon has a name? Probably curvature of lense and bending of light coming through it. But if not that...don't fret...there's a real and non-trivial explanation that doesn't involve the flat earth society. It's not hard to explain really. The change of the curvature is due to the lens being a "fisheye" type. Common camera lenses keep straight lines in the real world as straight lines in the photo as well. These lenses are called "rectilinear" type. Fisheye lenses show straight lines as curved, except for the very center of the picture; and closer to the edge you get, the more curved they are. The benefit is that the lens can see a lot more around it, than a rectilinear lens can. Because of that fisheye lenses are often used in security and surveillance cameras. The bending is always outward near the middle of the frame edge, and inward in the corners. If Earth happened to be near the edge of the frame, and sky near the center, then the sides of the earth will be shown curling in, rather than out. 65,000 ft, "edge of space"? Since when? In what universe? Ours, genius. 65,000 ft. is the outer limit of earth's atmosphere. Nothing after that but space. Jeez, use that computer that you're on to learn something. Layers of the atmosphere are Troposphere, Stratosphere, Mesosphere, and Thermosphere. The Thermosphere extends out to 320km. My daughter in the second grade knows that. Where in the world did you get the goofy idea that the atmosphere ends at 65k ft? Genius, indeed. BWAHAHA. There's nothing quite as hilarious as a moron spewing laughably inaccurate information in reply to an accurate post, then telling the accurate poster to do some research. Thanks, Steven, keep up the good work. This article is filled with all kinds of dumb. These aren't going into low orbit. Low Earth orbit requires a lateral speed of over 17,500 miles per hour. These balloons are practically motionless, with speeds in single and double digits. They're also not in space.These are at 65,000 feet, or about 12 miles. Space is 62 miles up. I suggest you go up in a weather balloon without oxygen, and report back to us when you reach the "edge of space"
Agreed; passenger jets routinely fly at 40,000 feet and military jets much higher. This is hardly the edge of space. Plus, blaming high winds for the failure of the device is pretty lame. The winds aren't to be blamed. Poor design is the problem. Who will be the pioneering first to send up a camera with a natural perspective lens? All balloon journeys I have ever seen use fisheye lenses to exaggerate the curve of the horizon. It even curves the wrong way when the camera looks down. I would like to see what it honestly looks like up there but no one has ever stepped up, especially not Felix Baumgartner whose lens was even more distorting than usual. Amazing how people come to these comment boards just for an excuse to b!tc# about absolutely anything. This is the coolest thing CNN has shown for literally years. Just enjoy it. Ummm. Silly question: Why a handheld microphone? Expecting to interview someone up there? This is all about a camera company giving away free stuff if people will get it on the news. Parachutists, mountain bikers, trombonists are all shilling this product. The commercialism doesn't stop there, because there's a CNN logo in the picture the whole time. "there's a CNN logo" Do you even read the stories before you start whining? Having the logo in the picture prevents anyone from using the film without crediting CNN. Everybody does it. There sure is a lot of negativity out there. Appreciate the story. It's probably a lot more interesting than anything most people have done lately.
" It's probably a lot more interesting than anything most people have done lately." Which is why they are whining so much. If this is cool, then what are they? Not cool, and they hate that. When will people learn that foam is not "space friendly". It IS a great story. For a high school newspaper. Are we all done ranting now? School's out and the teacher has given them their phones back. On the bus they do this, the way kids used to call people and ask if their refrigerators were running back before caller ID. When they get home, mommy will fix them a snack and they will go do something else. Other than to call attention to a group of attention seekers repeating something that's been done umpteen times before...the point of this story is????????? To annoy you Tom. Yes, you. You apparently missed the CNN poll that asked its readers who they would most like to have annoyed by a fluff piece and 63% of respondents selected you. I'm sorry to say I did not vote for you but I still support the majority decision and hope you are really annoyed by this and that you will comment about how dumb CNN to anyone you talk to today. It's not "low orbit" unless it's going at least 22,500 miles per hour. Please don't perpetuate misconceptions. Actually LEOs range from 2 to 1500 km which mean velocities range from about 17,240 to just over 25,000 mph. I wish blog posters would stop perpetuating misconceptions. We should correct fluff pieces with more accuracy and precision. I am in low earth orbit to a banana. Yum, bananas. I prefer to be launched up into space and stay there. That way I can be away from all the hateful people here on earth. Wait until one of these nitwit launched items get injested into a jet engine and brings down an airliner, then just how neat will it be. I wonder if these people have any liability insurance to cover a million dollar engine change out. Is it really so hard to actually read the article before making a fool of yourself with ignorant comments? Try to do more than just look at the pictures. I loved the hamburger in space! Got to buy a weather balloon! Darn shame helium is getting scarce to find. I don't like the idea of Go Pro cameras and cell phones falling on my head from a great height. You're lucky no one was hurt. It isn't orbit until your tangential velocity is high enough that you don't need power to avoid crashing back into the earth. "It isn't orbit until your tangential velocity is high enough that you don't need power to avoid crashing back into the earth." Wouldn't that include most everything up there? ISS needs power, Skylab lost power and crashed. Satellites decay and crash. All I see is, Android Win! Yes, pointless, but still awesome. Doing some simple research might have helped like the fact your equipment is going to pass through a region of the upper atmosphere when temperatures will drop to about 60 below zero this is most likely where your materials failed. It is illegal to use Ham radio for commercial purposes, which this appears to be. FCC may be very unhappy with you now. This type of thing happens all the time here in Arizona with a Amateur repeater and other things among the balloon's payload. I can be here in Phoenix on a 2 watt walkie talkie talking to a guy somewhere in New Mexico or California during the Balloon Launches. It's a very awesome experience! Why don't you try again. Next time send Piers Morgan up with the microphone and camera! Nah. Send Ted Nugent instead. How about Alex Jones? Plenty of hot air in there.... he'd make the balloon go up even higher!! A Lego Man is launched into near-space Jan. 26, 2012. Two Toronto high school students launched a Lego man some 80,000 feet into the stratosphere. Especially if it hits you on the head. And what if the whole thing, balloon and all had gotten sucked into a plane engine at 30,000 feet and brought 200 people crashing to the ground? That is why it was FAA approved, so all that could be monitored. Brad, come on now. The FAA does not approve of these things running around in the atmosphere. Believe me if one causes damage to any aircraft there is going to be major legal action against the person who launched it. Imagine hitting one of these things while doing 500MPH. It will be like getting shot with a 500MPH bullet only cause major damage to an alumiunum aircraft, maybe cause an explosive decompression, or even worse cause an engine to come apart with a resulting crash. After working in the FAA myself for 17 years in Air Traffic and in Flight Standards I can see no inspector singning off on such a project unless it has a tracking and working transponder on it that air traffic and TCAS can identify with. Dave and Steve win the "what if" game. Do you guys worry about every car coming down the road turning into your path. My gawd, you're worry warts. Dave, why do you feel the need to talk about things you obviously know nothing about? Weather balloons are launched routinely from weather stations all over the country multiple times every single day. Glad it didn't land on me! I'm not sure what the "story" is. Guy sends up balloons, and (surprise), they come back down. Hmm. Again, not sure how this is a "story" worthy of anyone's time to read it. I'm feeling more stimulated by simply considering my word choice in this post. I think CNN has too many people working for it who have too little to do, and so we end up with "stories" like this one. After all, what "stories" were the "enthusiasts" from the 12 other countries planning on writing? All the third step in the plan states is :"Have cameras come back to earth with video so reporters could do stories for their home countries’ television stations". Soooooo, I guess their stories were to be breaking news about gravity? What does Styrofoam look like when it breaks up in the upper atmosphere? There's just nothing to this, and I suppose it's even a bit aggravating to think that "news" is now the simple fact that a bunch of people got together and spent a bunch of money to do something completely worthless – all to produce a pretty ordinary portion of video. I'll give them credit for doing what they can to employ people to do useless things (like write, edit, or publish this 'story') in a time when jobs are so hard to come by. CNN's run by a bunch of losers, so you cant expect much of a story! Then why waste your time reading it. Your life must be really boring. I heard it was crappy. Reblogged this on Pinckneyville Press. "Whatever" to the haters. That was pretty darn cool to see. There's nothing like a little science and adventure (as long as it's safe). Not much science involved, just a bunch of half-baked hacks trying to do a stunt and they just couldn't hang. The Idiocracy will be televised. How does the microphone keep going from covered to uncovered during ascent and descent? CNN, why does the link to this article on your main page read "Cameras crash from the edge of SPACE"??? 65,000 is HARDLY the edge of space. I'm sick of your regular pseudo-journalistic hyperbole. They did not say which edge. I, too, first admonished the page developer (or whomever was responsible) knowing full well that "space" begins at 100 Km or roughly 63.5 miles or about 328,000 feet ... but maybe the writer/page developer considered "edge" to be whatever he/they/she wanted it to be. what can I say? It was enough to get me to read the article. Besides, if you actually put a payload into orbit or into space proper, you're going to have to have a lot more technology than a parachute. To wit, some way of slowing the package down in order to bring it back to earth without meeting a firey (sp?) end. Exacty. This was past the tropopause, but nowhere near the ~60 km (~200k feet) that is generally regarded as the "edge" of space. Furthermore, this stunt has been done to death already for decades, there is just nothing new about any of this, other than a CNN logo involved. LAME. None of you have any idea how many weather balloons are launched each day in this country: hundreds. The various weather services in this country routinely lauch 50,000 weather ballons every year and thousands more are launched at other times for other purposes. CNN project was just one balloon in what was probably 100,000 balloon launches that year. I did a project for one of the companies that manufactures instrument packages for weather balloons and they alone lauched dozens each day, not any of which had parachutes. And most use biodegradible foam instrument packages and biodegradible latex ballons. Just more uninformed people commenting on stuff they know nothing about. Typical. I'll be first in saying 'Safety to my fellow man (neuter) and beast' you wet dish rags are the reason this country is in the s-hole it's in right now. No one likes to do anything for the shear thrill, fun, or exploratory nature of the endeavor. Your too worried about spilling your coffee (while you text and drive) or breaking a nail – and yea, I'm talking about the emasculated men in this country. Take your kid, go for a walk in the woods (without a GPS!) and just see what you can see, hear, smell, and touch. Look up, look down, look around! Go blow something up – could be as simple as baking soda and vinegar (yes, wear safety goggles). Tear apart a flashlight and make the circuit with some wire and batteries (to teach your kid). Go 'DO' something. But, for the love of life, quit being a Mrs. Kravitz whining about all the what-if's as if you are a trial lawyer trying to write an Apple legal notice. In other words – go get a life. Um, then you'd be wrong. I race dirt bikes and have for several decades. I hike, mountain climb, maintain a one-acre garden, restore vintage motorcycles and Mustangs, competed in kick-boxing for almost ten years and played semipro soccer. The funny part is why I am even on a computer? It's really depressing. Think I'll go hike to the top of the nearest hill and forget about blogs. Cool is the term ! Also hilarious the "journalists" are not mentioned by name. Probably embarrassed to be associated with such an amateur stunt. It also good to see you editing this blog based on reader feedback – adding the line about "Do not launch a weather balloon without permission from the FAA or other appropriate aviation authorities!" But what are they actually "doing" besides sending a balloon into space to pop, fall back to earth and litter the atmosphere and likely the ground or ocean with a bunch of styrofoam? I think before you get on here and stand on your high horse assuming you know everyone's lifestyle and habbits, insult them and making yourself look like a fool, you should take your own advice and stfu. Noted; we shouldn't be so negative, as this was pretty cool. But, you're talking to a design-engineer_carguy_blacksmith_woodworker_hunter_redneck who spent his childhood making potato cannons and stealing pyrodex from his fathers gun cabinet. Did you see the pic of the apparatus before it was launched? It was a foam box with a LITTLE tape on it. I put more tape on my beer cooler when I go tubing. Just saying. I find it to be hypocritical, that's all. CNN being as liberal and eco conscious as they are, havie no problem sticking their nose in areas to specificially point out enviromental hazards and support those activits along with their holier than though movie stars supporters. I'm not being nagaitive, just have no idea what the point was and at the same time, thought I'd point out the sleu of styrofoam pieces that exploaded into space as this insignificant contraption broke apart. That was totally cool. It's not more dangerous than any typical 4th of July around my house. Seems like if I was spending thousands of dollars to put cameras in the sky, I would not block the entire view with a stupid toy. I would also consider using something better than Styrofoam and tape to secure it. I would also at least have some consideration for the safety of everyone else on the planet. What a bunch of hacks! There are fines for littering you know. It's only littering if you don't pick up the bits. It may have been months later however, the bits were picked up. someone having a little fun in life. To those concerned about safety and legality. I'm part of an amateur team that has done this quite a few times, and plan to do it more. We're at http://apollo67.com/ Here's info I can provide. This is indeed common practice, and the laws regarding it are quite straightforward. Most laws are based on total package weight. A radar reflector is required, and it is common practice (although not required) to notify the FAA of a launch to help them identify the object on their radar. All tether is required to be 50 pound tear, so that if it were to meet a vehicle, it wouldn't safely be destroyed. For most launches the total travel time is under 3 hours, and the decent is slowed by a parachute. Hopefully this clears some things up! it *would* safely be destroyed. The typical liberal approach to anything perceived as a threat, whether or not it is real or statistically significant: Ban and outlaw. You guys are a real piece of work. How in the world would you know whether any of the commentors are liberal or not. Typical uninformed and inflamatory comment from the lunatic fringe of the far right. It is absolutely not against any regulations. It absolutely is not illegal. It absolutely was pointless then and a pointless story now. Stop doing drugs people, seriously. The FAA wouldn't approve this activity if they thought airplane traffic would be affected. If anyone on the ground were hurt or if there were any property damage caused by falling debris from these experiments, the FAA has the names of the parties involved and could pass the information on to law enforcement. Yeah. The FAA might have something to say about this. If 3 GoPros, microphones, and a cell phone were to be ingested into a jet engine, some very bad things could happen. In older days, you could say "Oh the possibility is som small it doesn't matter.". But now there are so many aircraft in the air at any one time, the possibility is not as small as you think. Be careful people. You are correct that you need official approval to launch a weather balloon of this nature. In this case, the team got permission from the National Weather Service to use its station; the proper channels were notified. What was the point of this? Do we want to encourage people to send crap into the air and potentially disrupt flights, damage aircraft, damage property as it hits the ground? There's already a gazillion videos of this very thing on youtube. Now someone is hoping to get a little something extra like camera's colliding or hitting a plane or landing in traffic – enough of this stuff please. Methinks some folks need to Get. A. Grip. Something falling out of the sky on *some* peoples' heads might bring IMPROVEMENT in brain function. Sheesh. You didn't "set out" to crash these cameras back to Earth. What in the nine hells did you expect once they reached the edge of the limitations of the balloons? Irresponsible twit. I'm glad you read the article, especially the part regarding the parachute. Nothing like spreading more non biodegradable waste! This time, we did it in space with a bunch of styrofoam for absolutely nothing! Yaaaay! It all comes back down eventually. I don't think the Styrofoam would burn up (not moving fast enough) but yeah if you don't retrieve it from the ground you are essentially littering. Clearly a lot of people don't understand how astronomically unlikely that something falling out of the sky will hit anything important (such as a person). Precisely. Note, it took THREE MONTHS to find everything? BRIGHT ORANGE stuff? On residential (if rural) property, I gather. Look how long it took to find crucial remnants of the Columbia space shuttle. Sounds highly irresponsible to me. After the first group of students did this, the FAA made clear that they'd like to be notified, and grant clearance for these types of balloon launches. Which they will do, and I can only assume people working for a corporation like CNN would go through all the existing channels to do this legally. what about commercial aircraft? I assume sucking 3 go pro cameras into a jet engine would not make someone's day. Do people who do these experiments have to register with the FAA? If its under 4lbs you don't need permission from the FAA to launch. But either way its a good idea to contact them so they can send out a NOTAM to pilots in the area that there's an unmanned object in the sky. Alex, I'm beginning to suspect that you're some kind of serial poster of factual information. Better watch yourself 'round here, Junior. Better odds of being crushed by a vending machine. In which case, you're more likely to survive if the vending machine contains only DIET beverages, right? What was that sound? Its the sound of CNN's journalistic integrity smashing into a million pieces. This is just dangerous. Articles like this encourage people to do this. I saw this at a science fair and although kind of interesting, I really did not think it qualified as a science experiment. Wow – a video from the sky. What was the hypothesis? It's funny until someone loses an eye. Some of the science projects that kids do with the weather balloons consist of seeing the reaction of different materials in low orbit / upper atmosphere conditions. I've seen kids do it with a marshmallow specifically. As for dangerous? Huh? Are you really afraid of the debris falling on you? Most of the time the parachutes work so nothing falls anyways. Many objects fall from the sky, including satellites, and large chunks of ice from airplanes aside from also natural objects. Basically you have a better chance of being pooped on by the same bird twice within 1 day. Is that legal? What if the phone or other pieces had struck a person? I'm usually up for anything fun, but this seems highly irresponsible and I'm pretty sure it violated a few laws. Including FAA airspace regulations. If you can't fly a kite over 500', how can you do this? Legal? who knows, but NASA has way more lethal junk in space with no idea of how or where it will eventually hit when it comes back down but because they are a government agency, they are allowed to be just as careless with their experiments? And I don't by the whole "We're experts and your not" excuse. Seems the bigger an expert one is, the bigger the fallout when there is an accident, yet it's still acceptable if there is one. That said, you have a bigger chance of getting hit with a meteor, than someone's cell phone falling back to earth and if it didn't start with some guy in his backyard experimenting with rockets, we'd never have gotten to space in the first place and if not for amateur aviation pioneers, we wouldn't be flying, let alone have an FAA to regulate the skies. By they way, they sell rocket kits that will fly way beyond 500' with a payload and you don't need an FAA license to launch it. Guess we better outlaw that. Its legal. You just need to comply with the FAA regulation: 14 C.F.R. PART 101. Seeing that they took off from an airport, I would think they had clearance. If I'm gonna be miraculously struck by a falling I-phone (like, while I'm on my way in to cash in my lottery ticket, surely), please let it come in an awesome case. 'Kay?